Located in Takeo province, south of Phnom Penh. See the Nearby Phnom Penh Map. Angkor Borei is a town in Takeo province in the area of several ruins and archaeological digs. 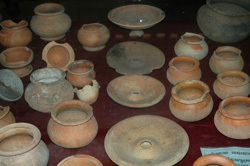 The area has been continuously inhabited for at least 2500 years and has yielded artifacts dating from the Neolithic period, the Funan period (4th/5th century AD) and Chenla (8th century AD) as well as the later Angkorian period (9th-15th century AD.) 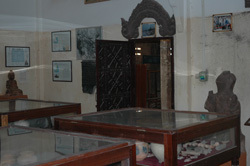 There are no significant temple ruins at Angkor Borei but there is a very interesting little museum displaying artifacts from the area and providing information on recent archaeological digs. About 20km from Angkor Borei is the hill of Phnom Da, crowned by an impressive 11th century Angkorian-era brick and sandstone prasat (tower) displaying some carvings in good condition. This structure was probably an upgrade of an previously existing 7th or 8th century structure. 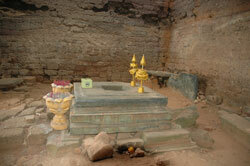 The temple was constructed under King Rudravarman and dedicated to Shiva. Further down the hill is the unique little temple ruin Ashram Maha Rosei, quite unlike other Khmer monuments in both design and adornment. 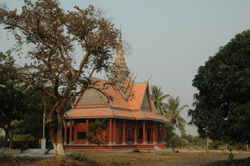 The unique design is reminiscent of Prasat Ashram Isay in the Sambor Prey Kuk group in Kampong Thom. 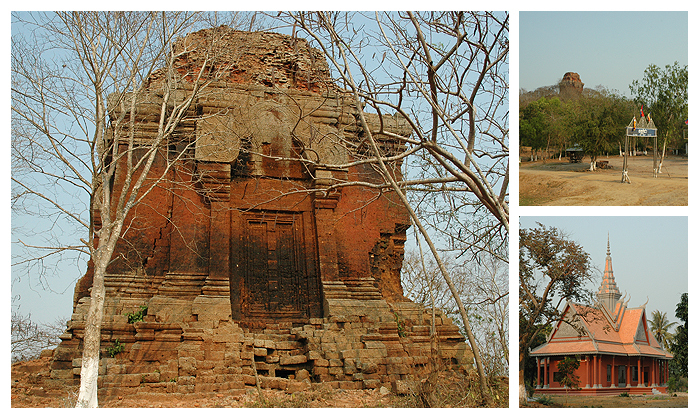 Ashram Maha Rosei was constructed of basalt stone and built in the late 7th-early 8th century (perhaps earlier), during the pre-Angkorian Chenla period, under Bahavavarman. 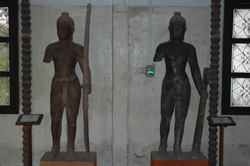 The design and adornments shows signs of non-Khmer influence. 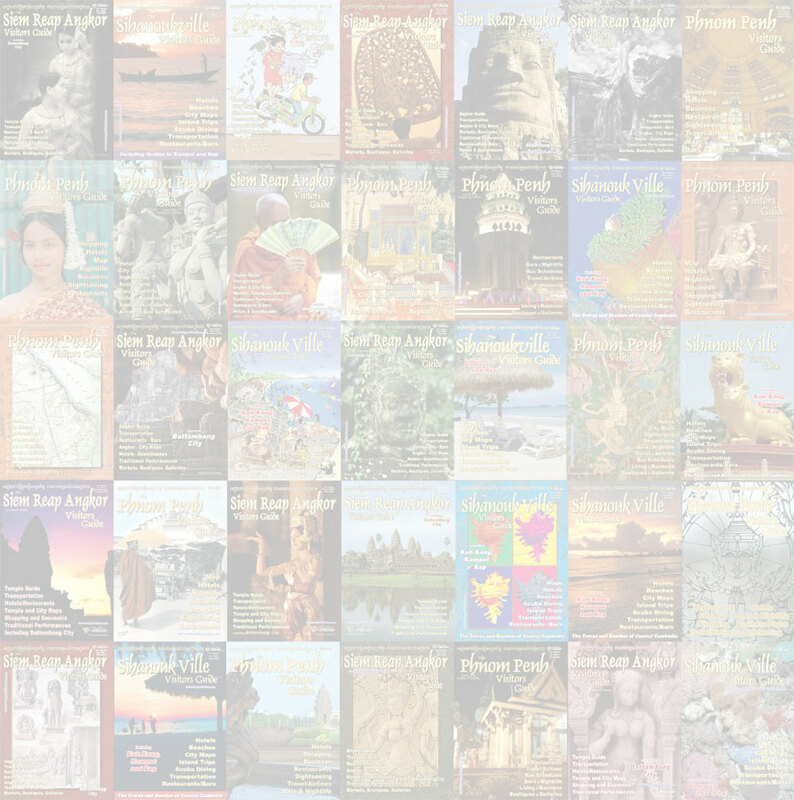 In the 5th Edition of her Angkor guidebook, Dawn Rooney suggests that the architecture of the Ashram is "derived from the temples on the Dieng Plateu in Java and from those in southern India fused with Khmer preferences." Getting there: During the dry season, Phnom Da can be reached by road or boat. In the wet season, it can only be reached by boat. By road from Phnom Penh: Take the Takeo City bound bus to the Phnom Chisor turnoff (52km from Phnom Penh.) The Phnom Chisor turnoff is well marked. Take a motodup or taxi to Phnom Chisor and then on to Phnom Da. Two hours on a rough road. By boat, take the bus from Phnom Penh to Takeo City. 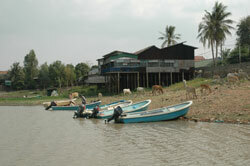 At the rivers edge in Takeo City, pick up a boat to Angkor Borei and Phnom Da. The boat will first travel to Angkor Borei and stop to allow you to visit the museum, and then continue on to Phnom Da. During the wet season the boat can take you right to the base of Phnom Da but in the dry season the boat will stop well short of the hill and will have to hike a ways. $25 r/t for the whole boat.